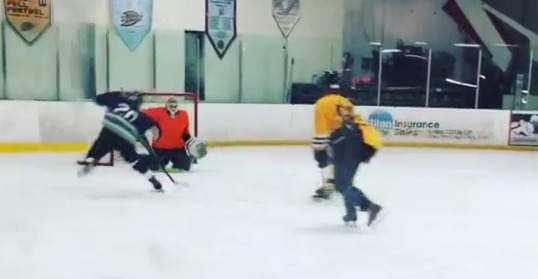 Justin Bieber shows off some Hockey skills on the ice. Justin was back at it at the Los Angeles Kings’ Valley Ice Center on Tuesday Oct21 and a camera was rolling as he played in what was either a pickup game or local men’s league game. He shared a video of an impressive goal he apparently scored. He claims that he is No. 20, and there’s no denying that he has some serious skills on the ice. “My dangles were unreal did u see that shot I’m number 20 #dontfuckwithecanadian #dangles #20 #younggretzky #iceicebaby #uthoughtthiswasagame #imadethatpuckmybitch #iknewistillhadit”, he captioned the video. When he got the puck on his stick, Justin keyed on the defender and made a nice move to get around him before whipping a shot into the top corner from in tight while falling. I like seeing videos where Justin is playing hockey.